I was in a gift crunch this week due to an ornament exchange I'm participating in. I've been needle felting some free form flowers but they were going nowhere, so I pulled together some cute day of the dead skellys made out of cloth/paper. 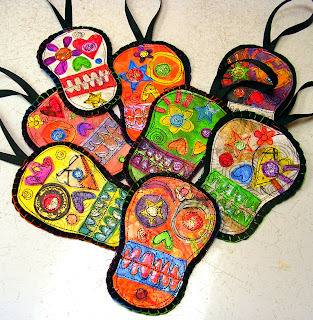 They are attached to black felt and then stitched. I added some embossing to the teeth and a little glitter for the eyes, then blanket stitched the outside. I was trying to figure out how to wrap them to put them in gift bags and came up with this super easy little pouch that came out tres elegant, so I thought I'd share! 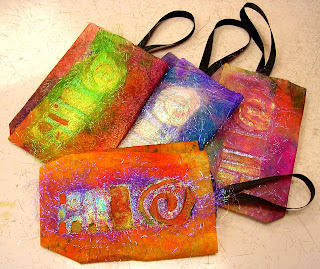 You will need some white paper towels, various inks (or use watercolors or diluted acrylics in a pinch), a smidgen of angelina fibers and a foam stamp. First decorate your paper towels by saturating them with inks. I like to crumple them up and spray them with ink or spill and blot it, then I uncrumple them and apply ink to the rest of the towel. Spray it down with water to get color into all areas. If you're fortunate enough to have some Schminke powders, sprinkle a little on the wet paint. Slip a wet paper towel between two sheets of teflon and iron it til dry. You could hang them up and let them dry naturally but you've got things to do! When they're mostly dry, iron them flat. Separate the layers to end up with two or more sheets of colored tissue. To make a pouch, fold in one short side and then overlap with the other. Use a glue stick to adhere. Then fold in the bottom, package style and glue the flaps closed. For the decoration, take a bit of angelina fiber and lay it gently on top of a foam stamp. Top with a sheet of teflon (thinner style works better here). Iron it briefly to melt the angelina, then pull it from the teflon and then from the stamp. You'll have a dandy little ornament. Glue this to the front and you have a decorated pouch as pretty as the gift inside! These pouches look great! Thank you for sharing the instructions. I just love those skull bags! They are great! Hi I just love these ornaments. Your work is beautiful. I'm adding a link to you on my blog. Neat stuff!!! these are great and it would be nice to use the technique for other motifs also. Yoo hoo...anybody home? We miss your colorful self, Kelli. Hope all is well.